AD BOAT PROJECT:PROJECT 2 DONATE:WA WA PROJECT-Social Creative Platform for Opportunity-Know and support projects in eastern Japan ! “Recovery support boat.” Just as the Formula 1, sales from selling advertisements whose company’s logo will be labeled on boats will go directly to the purchase of fishing boats. As an exchange of their financial contribution, the ad illustrates the message to thank for their action; while the boats themselves become the direct means for the fishermen. At the website that is currently under construction, the project is aiming to develop the best and useful communication system between supporters and fishermen to raise the funding to get their work place (=fishing boats) back. Their goal for the website is to create a sustainable business model so that the effort to raise the fund to help can last as long as needed. The Rejuvenation of a "Fishing Town"
Kamaishi is one of the world's three major f ishing areas. Currently, Kamaishi port lies scathed with damage from the tsunami, lined with ships that have been rendered useless. It is here that 'Daisangyo Yumaru', the boat of octopus fishing specialist, Hiroyasu Sasaki, has also been grounded. In March when the earthquake hit, the slime flounder fish was about to enter its breeding season, a period when the fishing industry would have become very busy. It was as Hiroyasu was helping his father to lay out the fishing nets by the waterfront that the earthquake struck. Knowing a tsunami would be coming, they put the materials in the small truck, and evacuated to higher ground. "From the higher ground I had escaped to I staggered watching my boat, my father's boat, and our family house being spun and washed away as if in a washing machine, unable to think of anything else." 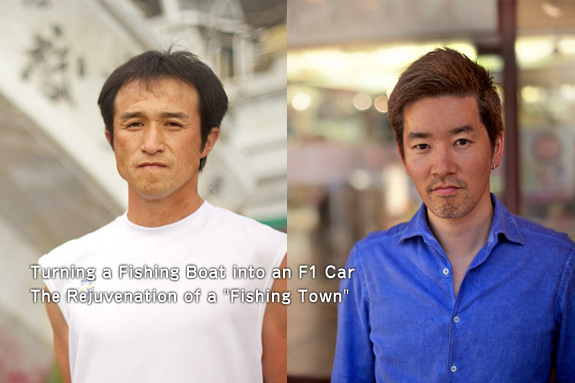 Hiroyasu isn't the only fisherman who has lost his boat. There are 500 fishermen who belong to the fishermen's Union of which he is a member. By some miracle a handful of boats survived,but hundreds of boats have fallen victim to the tsunami. 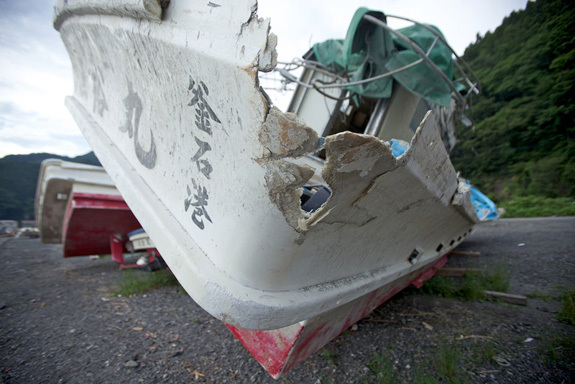 Even in the case of boats that did narrowly escape, damage to the shipyard which repairs the boats, and the washing away of fishing materials in the tsunami has meant that there is no foreseeable plan to send the boats out for fishing again.If the boats are unusable, it is necessary to get new ones before the fishing can recommence. However, in the current situation where fishermen have lost their livelihoods, it will be difficult to cope with the large costs of purchasing new boats and equipment. "My boat is 4.9 tons, and the cost of buying a new boat is 45,000,000 yen. Even if I were able to order a temporary boat in these parts, it wouldn't be seaworthy until the spring one and a half years from now.In order to be able to fish, it is also necessary to have barrels, nets, and other materials. In my case,it has been about ten years since I started fishing, but for my father and other veterans it has been several decades, and most likely more than 10,000,000 yen worth of materials has been washed away." Hiroyasu was brought up in the industry, watching his father as he fished along the Sanriku coast, and while having experienced working for a company inland, he chose to become a fisherman in his hometown. Before the tsunami had clearly made its mark on his ship, Hiroyasu had said to himself "if such a disaster occurs here I will shed tears", but he shows great determination to restart fishing as soon as possible. "I love the sea and fishermen, and to the limits of my physical strength, I plan to work on in this profession. The fishing industry should be defended and upheld as "a pillar of community development," otherwise I think it will be difficult to see a recovery in Kamaishi. I want to see members of the fishing industry make efforts to create a market with even bigger hauls, which will also contribute to industries such as the fish-processing factories where many mothers work. By doing this, it would be great if we could create a town where the local residents can live off locally caught food." The purchase of a new boat will be a big step towards recovery. Now, Hiroyasu is waiting for the day when he may restart fishing again through a new method of support. This is the start of a project to purchase a new fishing boat through sponsorship. The person who initiated the "AD BOAT PROJECT", a project that supports fishermen, is Sugawara, the manager of a shoe shop in Morioka City. The combination of shoes and fishing boats is a curious one at first appearance, but here lies hidden an idea that only Sugawara could conceive of. "Directly after the earthquake, I started activities to gather ten thousand pairs of shoes. When I saw shoe shops reopening in the local area not long afterwards, I began to think about 'recovery' in my own way. 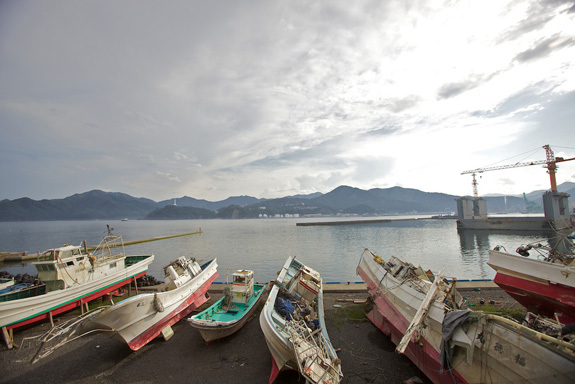 Business along the majority of the Iwate coastline is centered on fishing. If that is the case, I thought it naturally follows that we have to help the fishing industry recover. Originally, I used to love fishing, and so paid a few visits to fishermen I knew. At the time, when I asked them "what's the thing you most want? ", they always said "I want a boat". Since my profession is related to fashion, I also studied advertising a little. So, I thought maybe fishermen could be helped by creating a system of advertising for fishing boats in the same way that F1 business is sponsored with logos on cars." In short, the money paid as the advertising fee by organizations and businesses that have sympathies for the aims of the "AD BOAT PROJECT" becomes a donation. While it is the case that much money raised from countries all over the world has not reached disaster-struck areas,the special characteristic of this project is that it is possible to directly express "we have purchased a boat with your money", showing those on the supporting side how the money has been used. "This is a project on a large scale,so first of all I want to create an example. If I can do this, I can make presentations to big manufacturers abroad. I want businesses that agree to support us to consider using "boat advertising" for new business. In order to support the Iwate coastline for the next ten, twenty years, supporting businesses will also need to make some small profit else they won't make a long-term commitment. The time for businesses coming into effect as a result of the earthquake has arrived,and so I think people will agree to cooperate." Fortunate enough to escape a serious impact from the earthquake, Morioka City has a close relation to the Iwate coastline, and it is also a place where voices of victims can clearly be heard. The "AD BOAT PROJECT" has a role to firmly connect Morioka City with the rest of the Iwate coastline. "We will prepare boats and support fishermen up to the point where they can start fishing again. I want to restore the fishing trade, and allow fishermen to return to a "normal lifestyle" in which they can laugh again. From now on, I think the progression of this plan with the cooperation between sponsor(supporter), "AD BOAT PROJECT"(receiver), and fisherman will form a successful relationship. If it is successful, "recovery" for the next ten, even tens of years will be made possible. 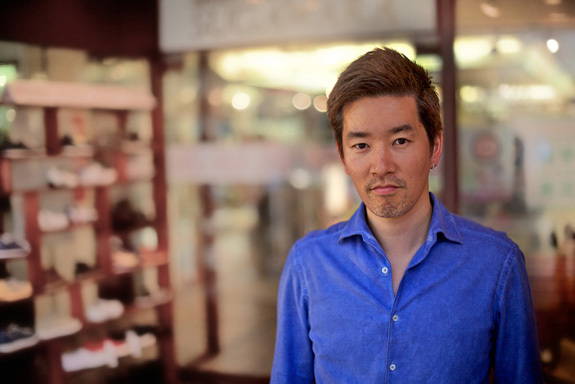 The initiator of "AD BOAT PROJECT" and owner of "Sugiwara Shoe Shop",based in Morioka city, Sugawara Makoto.Makoto has initiated a collaboration with the fashion brand "GEKKO" to form the "GEKKO Revival Support Parker" project. 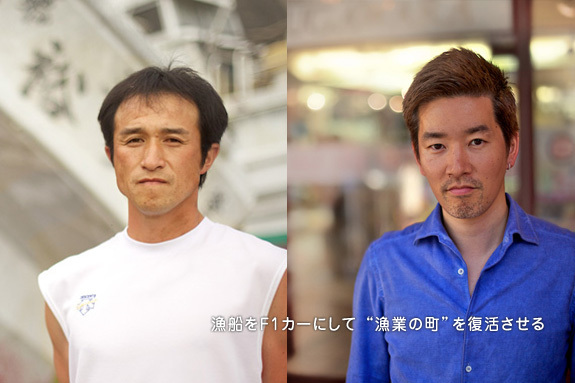 Sasaki Hiroyasu, who lost his fishing boat in the tsunami. If "AD BOAT PROJECT" is a success Sasaki will be a model case. Purpose: To operate AD BOAT PROJECT(first year) to buy fishing boats for fishermen who lost their boats and to fund fishermen to manage them. Fishing boat is symbolically the knot to tie the locals’ sense of community. “Logo” is one way to illustrate the sense to the connections. This project does just that. “If fishing boats are back to our ocean, this fishing village will naturally recover.” Fishing boats = a sense of thrive. This project is dealing with the real issue that we can no longer ignore.